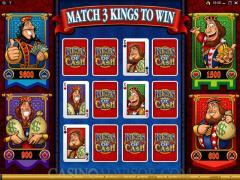 Kings of Cash is a Microgaming online slot game. It is centered on the theme of the four suited Kings in a pack of cards. The symbols depict wealth and royalty. The Kings of Hearts, Spades, Diamonds and Clubs appear as symbols on the reels carrying various forms of wealth like moneybags, gold coins and cash. The other symbols include Treasure Chest, Throne and Coat of Arms. There are two scatter symbols, the Crown and the $ Sign. The Kings of Cash Logo is the wild symbol. Kings of Cash is an audio visual delight. The symbols are exquisitely crafted adequately displaying royal demeanor. The background music and the win sounds are both suitable to the theme. However the best aspect lies in the animations. Every symbol exhibits animations when in winning combinations. The four kings gleefully show off their wealth. This animation also features in the bonus rounds. The Treasure Chest spills out is horde of gold coins and the Throne gets surrounded by money bags. 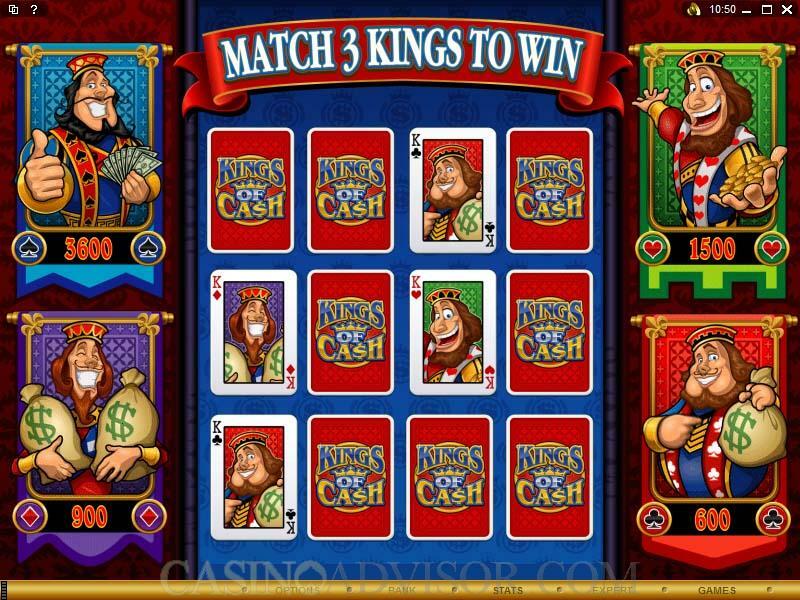 Kings of Cash allows players to choose from all three betting options. The coin denominations offered are 0.01, 0.02, 0.05, 0.10, 0.20 and 0.25. Players can wager up to 20 coins per payline. Hence the maximum line bet works out to 5.00. Some high rollers may be disappointed at this. The slot game has 15 paylines, which too is on the lower side. The betting options can be selected in the usual manner by manipulating the buttons below the reels. 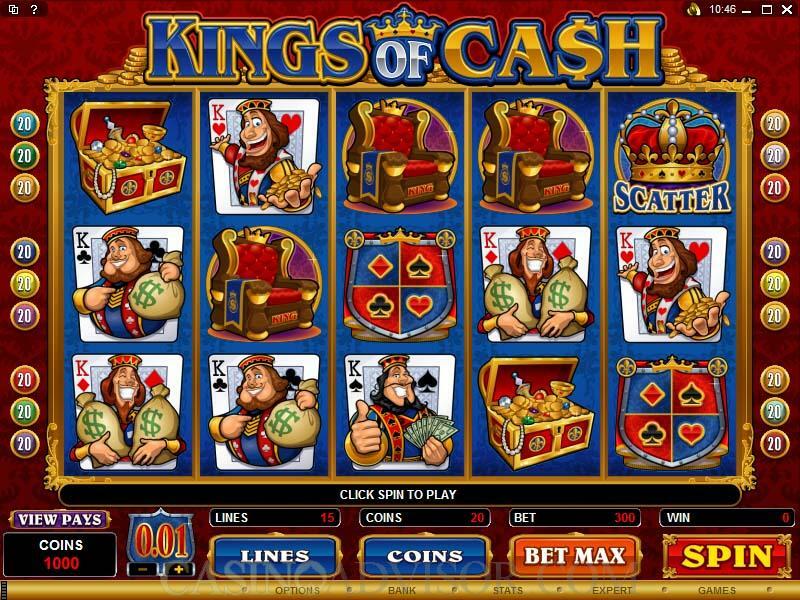 The Kings of Cash Bonus is the bonus game on the second screen. This is triggered by three or more Crown scatter symbols. 12 cards are laid out in a 4 x 3 matrix. There are three cards of each King. A payout value is indicated for each King. Players open the cards one at a time. As soon as they match three Kings of the same suit, they get the payout designated for that King. The payouts depend on the number of scatter symbols appearing on the reels. For three scatter symbols the payouts are 2 to 100 times the total bet. For four scatter symbols the payouts are 5 to 150 times the total bet. For five scatter symbols the payouts are 10 to 1000 times the total bet. Three or more $ Sign scatter symbols trigger the free spins bonus round. Three scatter symbols pay 1 times the total bet and award 10 free spins. Four scatter symbols pay 5 times the total bet and award 15 free spins. Five scatter symbols pay 10 times the total bet and award 25 free spins. All payouts are doubled during free spins. The free spins can be retriggered and the Kings of Cash Bonus can be triggered during free spins. 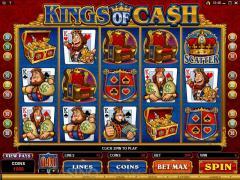 Kings of Cash slot has the Gamble Game as well. Any payout can be staked in the Gamble Game. Choosing the correct color doubles the payout. Choosing the correct suit quadruples the payout. Choosing incorrectly results in forfeiture of the payout. Interested in reading more detailed information about Kings of Cash? If so Click Here for more details.